First, I’d like to clarify the concept of Architecture and the Service Oriented Architecture in this context. The original definition of Architecture by Sir Henry Watton in The Elements of Architecture stated “In architecture as in all other operative arts, the end must direct the operation. The end is to build well. Well building has three conditions: Commodity, Firmness and Delight”. This definition is applicable to our context as well, where the position of architecture for IT is similar to the position of architecture for a building construction. The purpose of IT architecture is for the effective and efficient operations of IT. IT architecture should serve all its relevant audience and stakeholders, should be understandable by them via various views (commodity). The architectural products has to be solid and practicable for implementation (firmness), and it has to be well accepted and appreciated (delight) to be adopted and be effective in guiding IT operation. The core of architecture is its vision, insight, concepts presented, and implementation guidance. It is a practical art, a result of creation, which is not a result of engineering or process in a mechanical manner, but it guides engineering process for implementation. IT is evolving to be a line of business by itself. Therefore, IT architecture is in a complex domain of people, systems, and culture; and in a constantly changing environment. It has the similar composition of enterprise architecture in this sense, with IT being one segment in an enterprise. For such architecture development, it is important to balance discipline and control with flexibility and freedom for organic growth, due to the limitation of human capability in predicting the changes and in handling complex matters. The shared service domain is actually a sub-domain inside IT. We cannot expect all functions in IT should be shared. 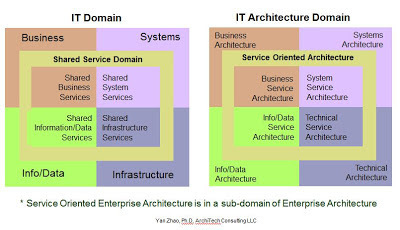 Similar, the Service Oriented IT Architecture is in a sub-domain of IT architecture. The necessity of making a function to be a service only when it has potential to be shared and reused by multiple service consumers. The following figures illustrate the shared service domain inside IT domain and the service oriented IT architecture inside IT architecture domain. The “Plan/Build/Run” is a typical and simple IT operating model, which is still valid if we apply lifecycle with it, and have service orientation content being imbedded into all its operating stages. The lifecycle presented in ITIL (Information Technology Infrastructure Library) can be considered as its extension from IT service management prospective. ITIL has five stages instead of three: Service Strategy (plan), Service Design (build), Service Transition, Service Operation (run), Continual Service Improvement. We are going to discuss later here on ITIL as an integral part that fit into the Plan/Build/Run model, which focus on IT service portfolio management and IT service management lifecycle. The Broker/Integrate/Orchestrate model is one of the possibilities inside the content of Plan/Build/Run model, while there are other possibilities as well. A plan is still necessary, no matter the plan is to build something new or to act as a broker, to build something in-sourcing or out-sourcing, by brokerage or by integration. Usually, there are diversified elements based on circumstances. It usually needs more than just orchestration to run it. All these could be part of the “IT Operating Model”. It is dangerous to just assemble what services/products available in market without a future vision and a plan for long-term evolution. For a business to survive in a longer term, it has to know its own needs instead of being framed by what is available in market. It needs to create its unique product/service roadmap and pipeline, and not to be controlled by others. In order to provide effective and efficient IT support and reduce complexity and cost, IT is evolving to provide commodity services that enable the separation of business functions from common shareable IT services. To operate IT as a service, it opens a new line of business, as identified in Federal Infrastructure Optimization Initiative. 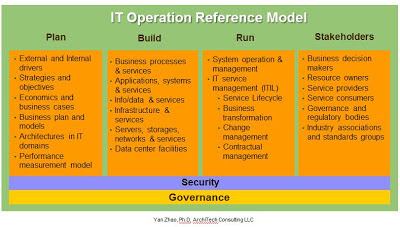 The IT Operation Reference Model illustrated in Figure 2 is based on such considerations. It provides a holistic view on what involved in operating IT as a line of business. IT is becoming one business segment inside an enterprise with its own mission and goals to achieve instead of being only in a supporting role as before. This Reference Model can help to organize and consolidate organizational core capabilities and to provide a simple and cohesive view. 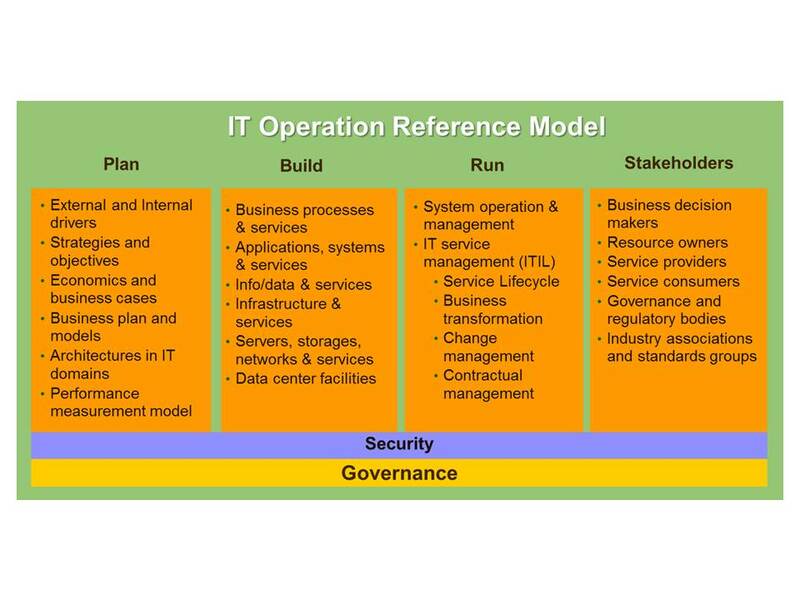 The IT Operation Reference Model, illustrated in Figure 2, consists of four pillars: Plan, Build, Run, and Stakeholders. It is an extension to the Plan/Build/Run model, and is constructed with considerations in service orientation, modularity, simplicity, and communicability. It operates in a lifecycle as illustrated in Figure 3. Security, as illustrated in Figure 2, is not only a technical solution, but also an integral part across the board. A security life cycle and process should be designed and associated with each stage in an IT operation lifecycle, with starting from the planning stage. Also, governance should be applied across the complete IT operation lifecycle as well. The Service Portfolio Management is part of IT Service Management (in Run pillar of Figure 2), which is addressed in ITIL V3. ITIL provides a best practice reference for IT service management and operation, with current enhancement (in V3) in service portfolio management. Applying ITIL within an IT Operating Model enhances IT Operation with a service lifecycle management discipline. However, the specific architectures, models, service design, and ITIL adoption for each IT operation have to be based on each individual case, and an operating model should be built accordingly. Plan: IT still needs strategy and plan to run even in service oriented IT operation paradigm, where the business model, service model, cost/funding model, implementation model, and operating model suitable for service orientation should be incorporated accordingly. In another words, the difference is in the content. The plan for new generation IT operation should be driven by business domain requirements, e.g. the external and internal drivers, so that to support business improvement goals and objectives. Architectures should be created accordingly. Also, a performance measurement model should be created to provide measurement guidance. The plan should well consider adaptability to changes in both business requirements and technology advancement, and be maintained as a live document with continuous improvement along IT operation Lifecycle. Build: Business requirements drive technology decisions; and at the meantime, the new technologies will inspire business envisions and provide various possibilities for business being operated in a more effective and efficient way. It’s true that the IT product ownership implies slow change due to the cost associated with. The resource sharing and operated by some specialized service providers enable faster change due to cost sharing in nature. Also, the performance from such service providers can be enhanced by competition. The implementation mechanisms should be flexible enough for new services and devices to plug-in or to update. However, not everything can be handed out to others to operate. Enterprise data are likely still being managed inside enterprise for security reasons, with enterprise internal stewardship and ownership, though it can participate in shared services internally and externally. 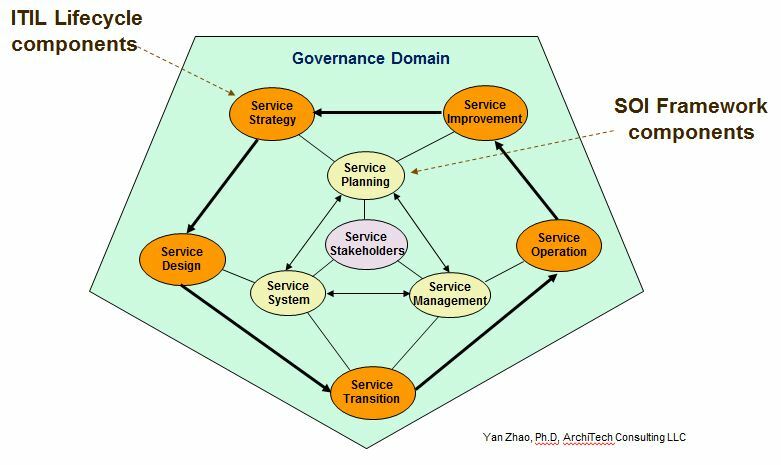 In this reference model, services and systems to be built are described in layers: business services, application and data services, infrastructure services, and physical services. Run: This includes IT system and service management and operation during continuous performance and change. The system operation management includes the management of IT service systems, system hardware and software, as well as networks and data centers, either in-sourcing or out-sourcing. It also includes the management of applications and data that are resided and running on these systems. For IT service management, ITIL is a handy best practice reference to start with. Stakeholders: The stakeholders should be identified across the three pillars or the three operating stages in a lifecycle. Clearly roles and responsibilities should be identified, and be aligned with the operation structure. The operation model, structure, and architecture should be defined independent of individual stakeholder, so that people changes will not affect organization structure, process, and operation. Typically, the stakeholders can include business decision makers, resource owners, service providers, service consumers, governance and regulatory bodies, industry associations and standards groups, etc. · Objective: The IT Operation Reference Model intends to provide a simple and cohesive view on IT operation domain structure, components and relationships; while ITIL focuses on providing guidance and reference details for IT service management and operation. · Components: The IT Operation Reference Model focuses on IT functional components; while ITIL focuses on IT operational components. 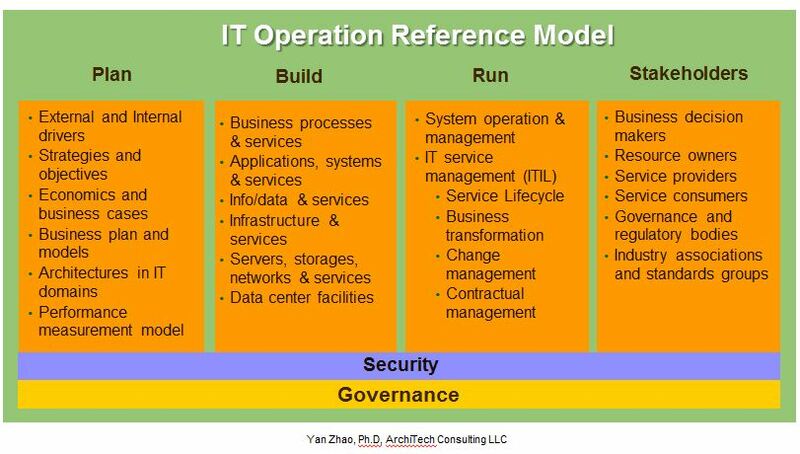 · Structure: The IT Operation Reference Model is structured into categorized and layered components in each stage of IT operation; while ITIL is structured around IT service management and operation lifecycle to provide its associated best practice references. In Figure 3, the middle section illustrates the relationships among the four pillars in the IT Operation Reference Model. The stakeholders play the central operating roles. They should be the driving force and active players in IT operation lifecycle. The stages of ITIL service lifecycle can be linked to the stages in Plan/Build/Run IT operation lifecycle. The lifecycles of both reflect iterative processes during IT operation. A well architected service lifecycle and management processes can maximize operational efficiency and productivity, as well as reduce the costs. In conclusion: A Service Oriented IT Operating Model should be rooted on a Service Oriented IT Architecture, which has to be custom built for each individual IT organization based on its service requirements, responsibilities, and operating environment, though best practice reference can be helpful. Each IT operation is forming an ecosystem of its own, which needs insight, creativity, and systematic discipline to figure out the best operating model and to clear the way for its execution. This is great stuff! I really think your IT leadership, strategy and management concepts are insightful and right on. Thank you for sharing! Its really informative some facts and other points given here are quite considerable and to the point as well, would be better to look for more of these kind for efficient results.